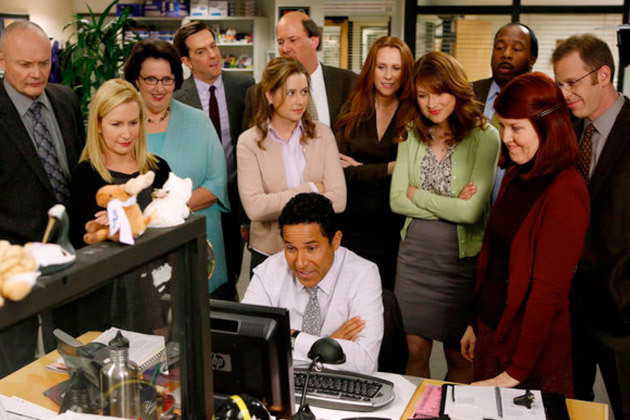 Since bringing you part one of this special series several months ago, I have felt the need for a part two, centering on supporting and minor characters from The Office. Let's explore these crazy characters and their antics and find out why they do the things they do! 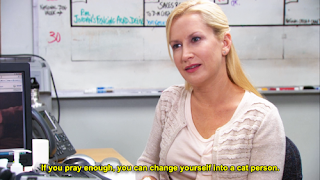 Angela Martin -- ISTJ "The Logistician"
While I would certainly say that Angela is a rather caricatured and exaggerated version of an ISTJ, I would say that she's an ISTJ nonetheless. She is perhaps an oversimplification of the type. ISTJs are often known as rule-followers, with an extremely strong sense of personal integrity and accountability. However, this accountability can lead to her being disliked around the office. She may sometimes speak her mind too freely and say unkind and hurtful things. She's not a terribly tactful person, but she performs well at her job and gets things done well and accurately. Creed Bratton -- INTP "The Logician"
Creed is certainly not a typical INTP. (He's perhaps what an INTP is like after years of doing drugs. That dude's brain is gone.) His logic is strange to the world around him, and yet his brain makes perfect sense to him. What regular person would ever sprout mung beans on a paper towel in his desk drawer for nutrition? (The smell, man. The smell.) Or who would admit to the camera that "I just really like stealing things"? Only Creed. Only Creed. Creed is certainly a daydreamer (he can't even remember what his job title at Dunder-Mifflin is), and yet his unemotional logic and self-assurance are what convince me that he's not a Feeling type. He doesn't often interact with his co-workers, because of his Introversion. And his utterly strange, disorganized mess of a self is a clear mark of an iNtuitive Perceiver. (I'm one myself.) Creed might just win the medal for the strangest character on the show, which is a feat unto itself. Kelly Kapoor -- ESFP "The Entertainer"
Upon really digging into these characters, I found another ESFP among the bunch besides Michael Scott: Kelly Kapoor. Getting stuck back in the annex doesn't give her enough time to get all of the attention Michael does, but she makes it count when she can. Her personality can fill up the whole office. She's incredibly extroverted and quite impulsive. Like most ESFPs, Kelly is a very emotional person. She also loves the spotlight and attention. One thing people might not recognize, though, is that Kelly is incredible with people. She works in customer service and no one in the office could do the job quite like she can. She knows exactly what to say to disgruntled customers and that is a true gift. Andy Bernard -- ENFP "The Campaigner" or ESFP "The Entertainer"
For Andy, it was a nearly impossible decision to make in regards to his personality. If anything, I might say he's borderline between a Sensor and an iNtuitive. With someone of his caliber of personality, it's a tough decision to make. On the one hand, he makes some very split-second decisions that tend to border on the N side, but he also has a perspective on life that is very sense-oriented, not always intuitive. However, these types are often difficult to distinguish between, so let's talk about things we know for sure. Andy is a crazy extrovert, joining the ranks of Michael Scott and Kelly Kapoor. He loves to entertain (often reaching Michael's ranks in that department) and to be the center of attention. Although he may seem very easygoing, on the inside he's very sensitive, and perhaps easily duped. While he may not always be liked, he has a generous heart. Holly Flax -- INTP "The Logician"
Holly has always been one of my favorite characters on this gem of a television show. Though she seems a lot like Michael at first, she's actually quite different from him (even though they're just both total goofballs). She enjoys having her own space and time, and her Thinking side helps her make unbiased decisions concerning her HR job. She's not swayed by her feelings the way Michael is. But she also has the crazy spontaneity of most iNtuitive Perceivers. She tends to go with the flow and laugh at herself and others, just as Michael does. They're almost together, and it's not difficult to see why. Who from The Office are you most similar to?